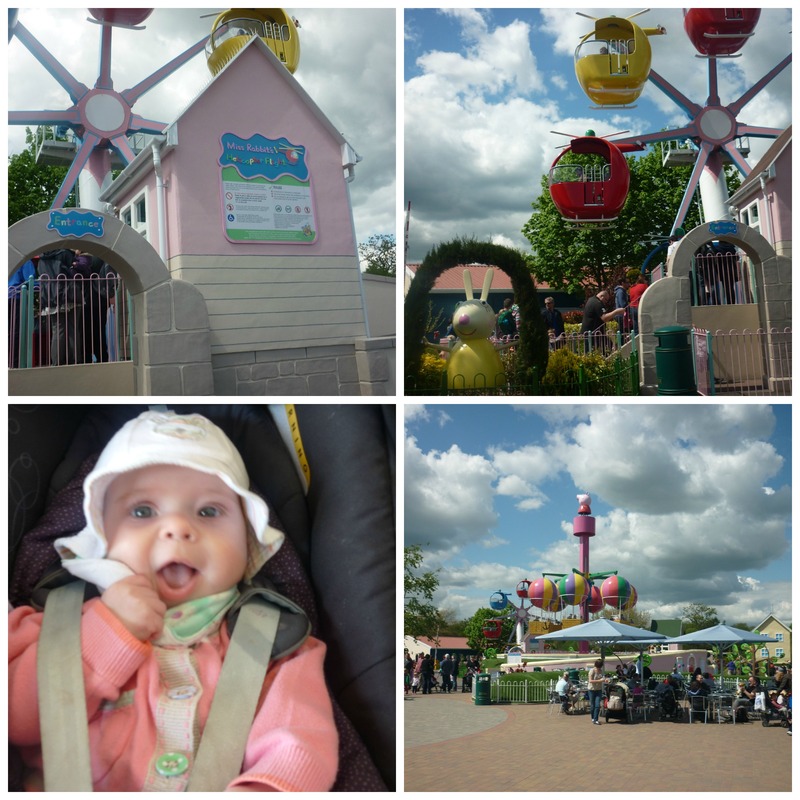 On Thursday we visited Paultons Family Theme Park, the home of Peppa Pig World! We booked our tickets online the night before and saved £5, this negates queueing and you simply read out the voucher code to the attendant on the gate to enter. We just paid for two adults, because both of our Children are under 1m tall. The cost was £46 and this included a £1 booking fee. 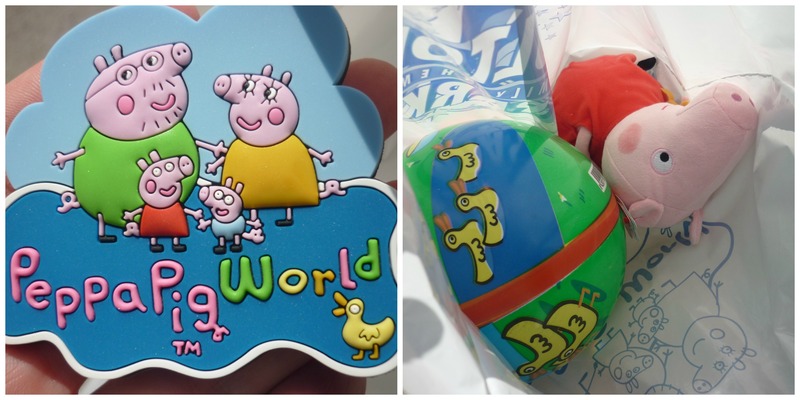 As our Children are both under two, we headed straight to the Peppa Pig World area of the park. It was easy to find our way around, and staff were helpful at the entrance gates. There are lost children stickers and they have a single or double buggy hire available. Gabriel was very excited from the moment he had his breakfast and as we entered the park he was singing the Peppa Pig theme tune and making pig noises! We went on rides as soon as we got inside! The park is so lovely and inviting. 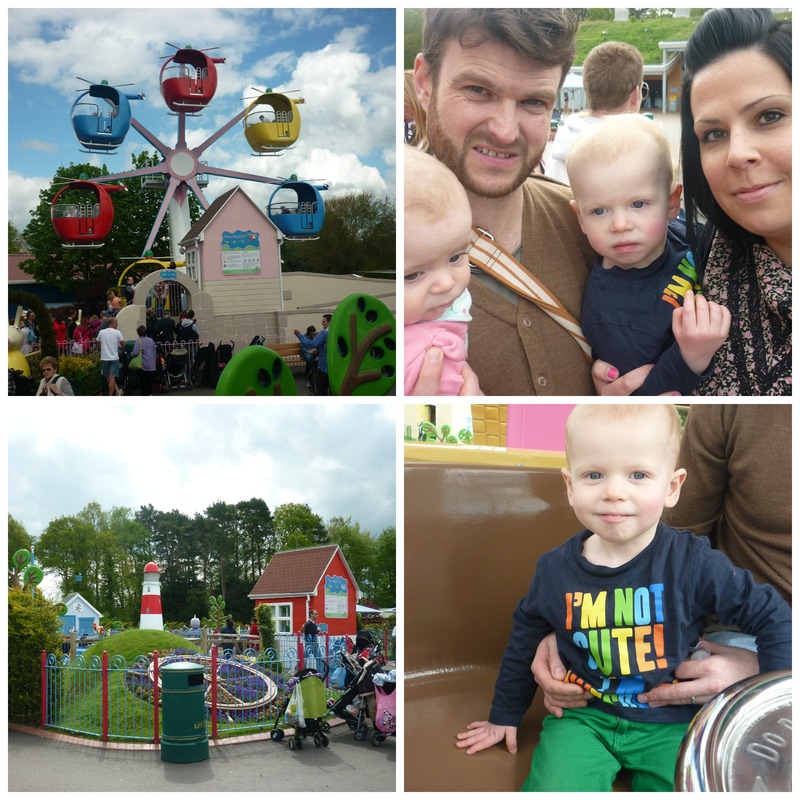 Paultons have got the atmosphere just right, it’s not daunting for little ones and the Peppa Pig music doesn’t ring in your ears! 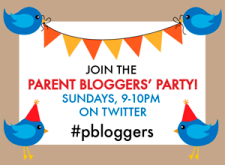 The first ride we came across was ‘Peppa’s Big Balloon Ride’. We noticed that everyone had lined their prams up around the sides of each ride whilst they were on them, so we did the same. 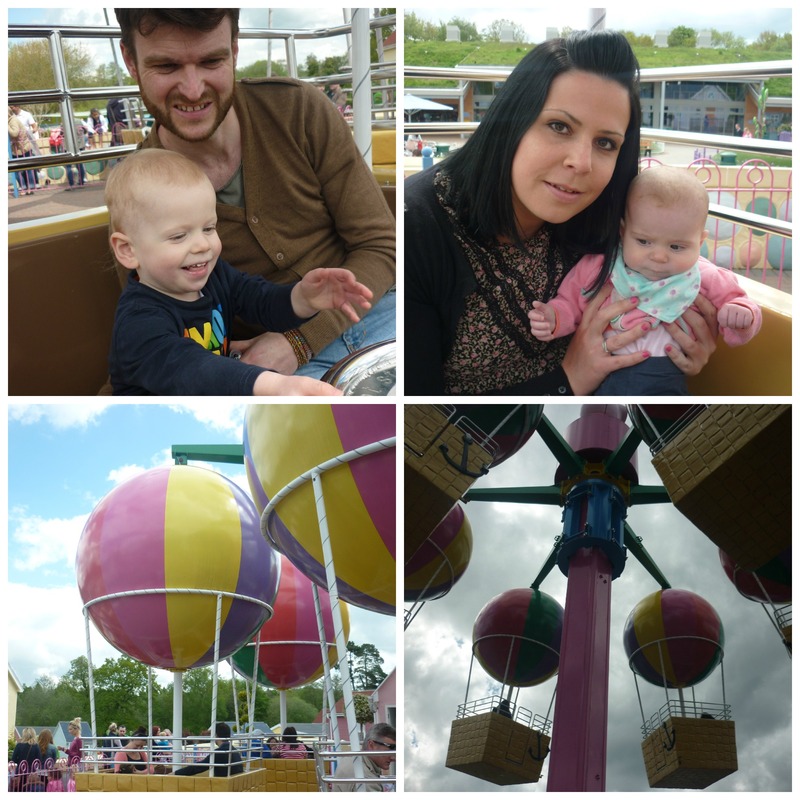 All four of us queued for the ride for about five or ten minutes, then we climbed into a balloon and off we went! Gabriel loved the ride, and giggled away. It was lovely being able to ride as a Family, rather than one of us having to wait with the pram! Next we climbed aboard ‘Grandpa Pigs Little Train’ It was so sweet and colourful! 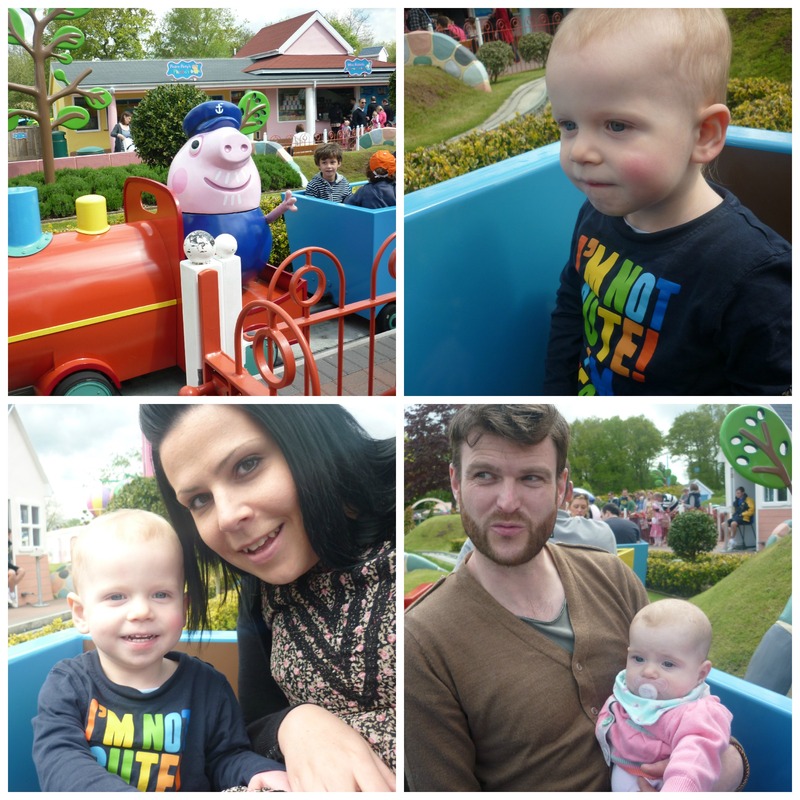 Gabriel is obsessed with cars and trains at the moment and so this ride was most definitely one of his favourites. Again, we were all able to ride together which was lovely! We decided to have lunch whilst it was quiet in the picnic areas. Paultons have done a fantastic job with building lots of shaded seating, that can be used for either picnics or eating the food purchased there. We took a picnic, and I was glad we had. The weather was glorious and it meant that we saved money (and time too). I did have a look in the ‘Daddy Pig’s Big Tummy Cafe’ There wasn’t a huge selection of food, however there was a meal deal for children and some tasty looking pizza! 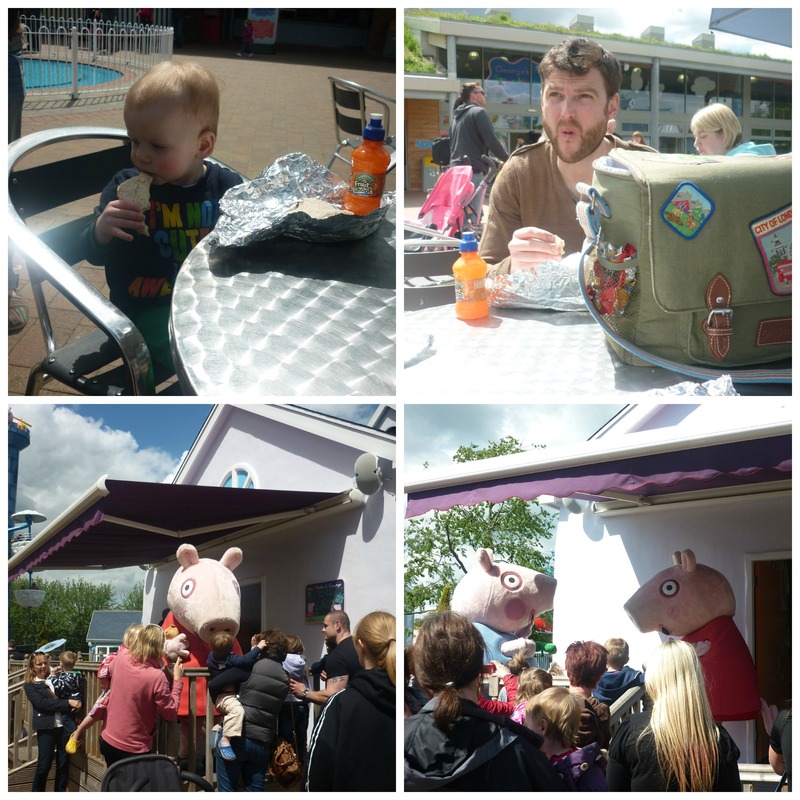 Whilst we were eating, Peppa and George came out on their stage to meet and greet their guests! We went to see them. They did not rush and hung around until everyone had their photos and had seen them. Another great point, thank you Paultons! 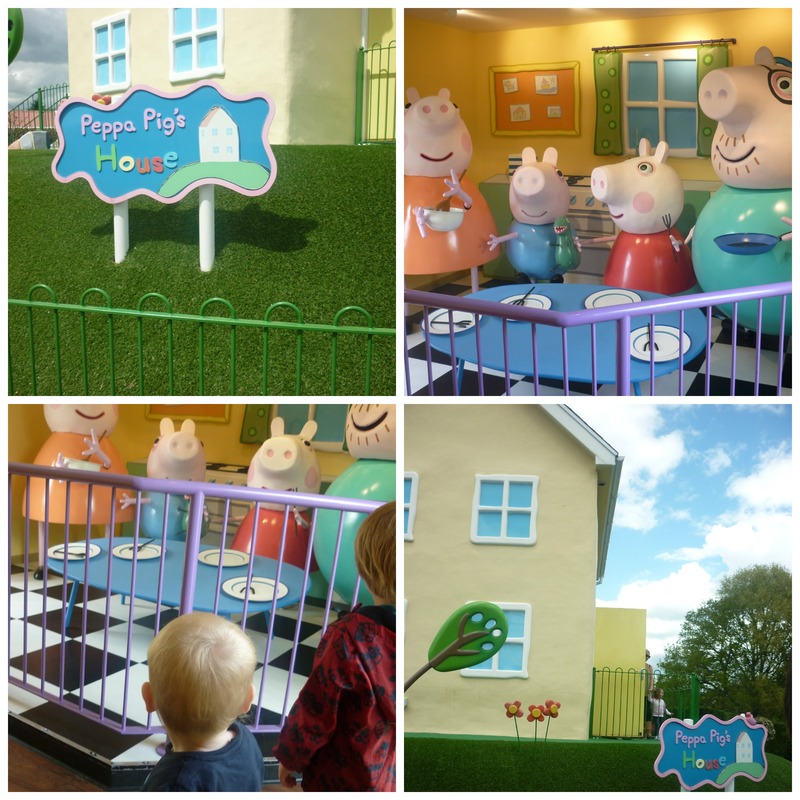 So we could let our food settle, next we paid a visit to Peppa Pigs house! Inside we found Peppa and her Family eating pancakes. We listened to the story Gabriel loved it! After Peppa’s house we went on ‘Daddy Pig’s Car Ride’. Willow had fallen asleep at this point so I went on with Gabriel and Daddy waited with Willow and the pram. Gabriel especially loved this ride, as he got to ‘steer’ the car by being in the driving seat of our car. Again there was only a five-minute wait for the ride and the staff were very helpful. Whilst Willow slept we took the opportunity to visit the ‘Mr Potato’s Playground’ outdoor play area, and the ‘Muddy Puddles’ water playground. All the facilities were great. 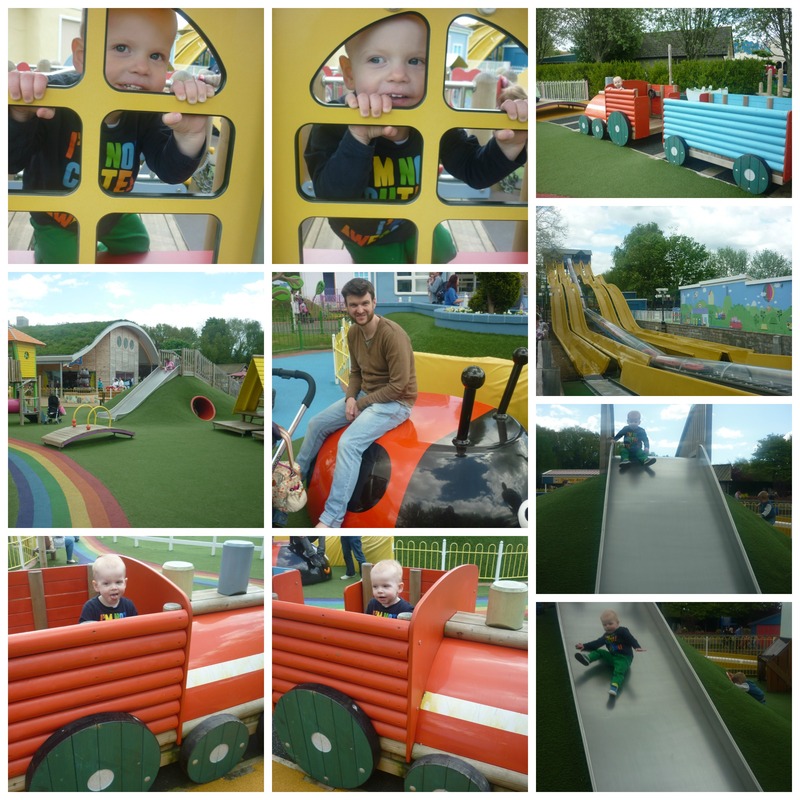 Paultons have aimed the play area at under fives, which suited Gabriel perfectly. He was able to climb and slide, whilst still being challenging for him in parts. It is by far the best outdoor play area we have seen. So colourful and well maintained, I did not see anything Gabriel did not enjoy. Once Willow woke, we took a walk around the park, unfortunately Gabriel wasn’t tall enough (900mm) to ride the ‘George’s Dinosaur Adventure’ ride, but this was not a problem. There were so many other things to do. We then decided to ride the ‘Windy Castle’ ride, this had no queue! Gabriel and I went on as it was quite high, and we thought it inappropriate to take Willow on. (Daddy also does not like heights!) This ride was good fun, and we had a great view of the park. Next Daddy took Gabriel on the ‘Miss Rabbits Helicopter Flight’. It took quite a while to get all the riders on, but once it set off it was great. The only draw back was that if you are in a ‘two’ you may not be able to sit in the front, luckily Gabriel was able to ‘drive’ and loved it! We went into the ‘George Spaceship Play Zone’ which essentially is a soft play centre. It’s separated into age range, which is great. It’s clean and also really interestingly themed, with a pretend ‘recycling area’ etc. Gabriel loved it in there (I imagine in the rain it comes rather hectic though). We grabbed a coffee whilst Gabriel ran around and tried out the slides! Our last ride was ‘Grandpa Pig’s Boat Trip’. It was great fun bouncing up and down in the water. It’s the same ride as the viking ride, which is on the way into Peppa Pig World, but Gabriel went on both and loved them equally! There are photo opportunities on some of the rides, but it was easier (and cheaper) to take them ourselves! You can buy a reasonably priced bundle of four for £20 though, including key rings and prints. Soon it was time to leave, we visited the ‘Peppa Pig Toy Shop’ They had some fabulous items, such as Mummy Pig and Daddy Pig T-shirts! (We didn’t buy..) We let Gabriel choose a toy. He chose a ‘Peppa Pig Beanie’ and also wanted a ball. We bought both for £15. We also purchased a fridge magnet for our collection which was £3.50. 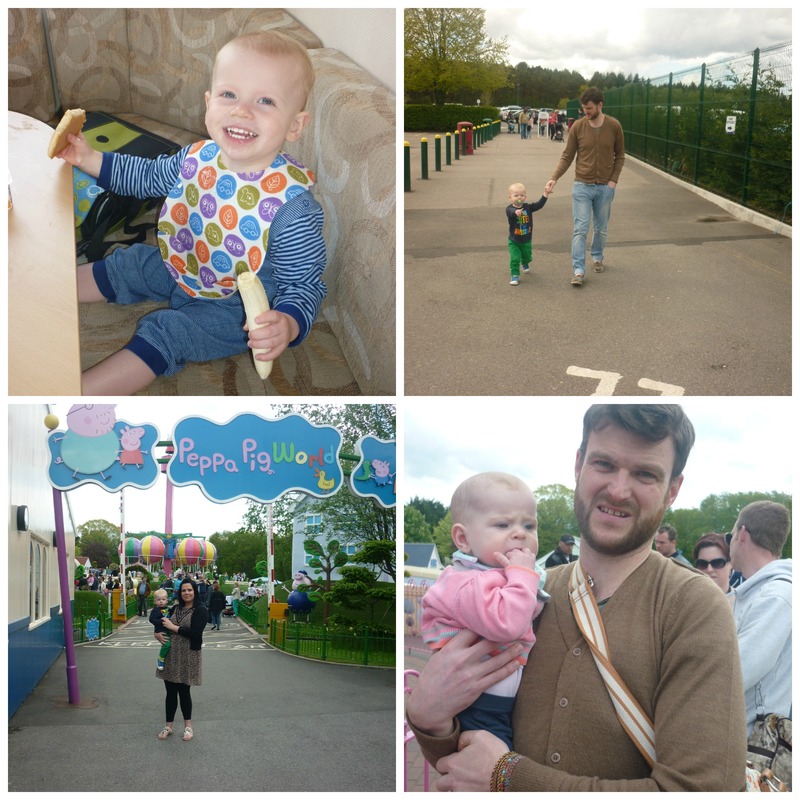 We had an amazing day out, and we didn’t even venture into the main park! We were lucky that the sun was shining and we didn’t have any rain all day. We will be back next year, but we will be buying a two day pass so we can visit the animals and other rides in the main park too. Daddy said it was one of the best days out he’d ever had, and I have to agree! Lots of giggles, smiles and excited faces. 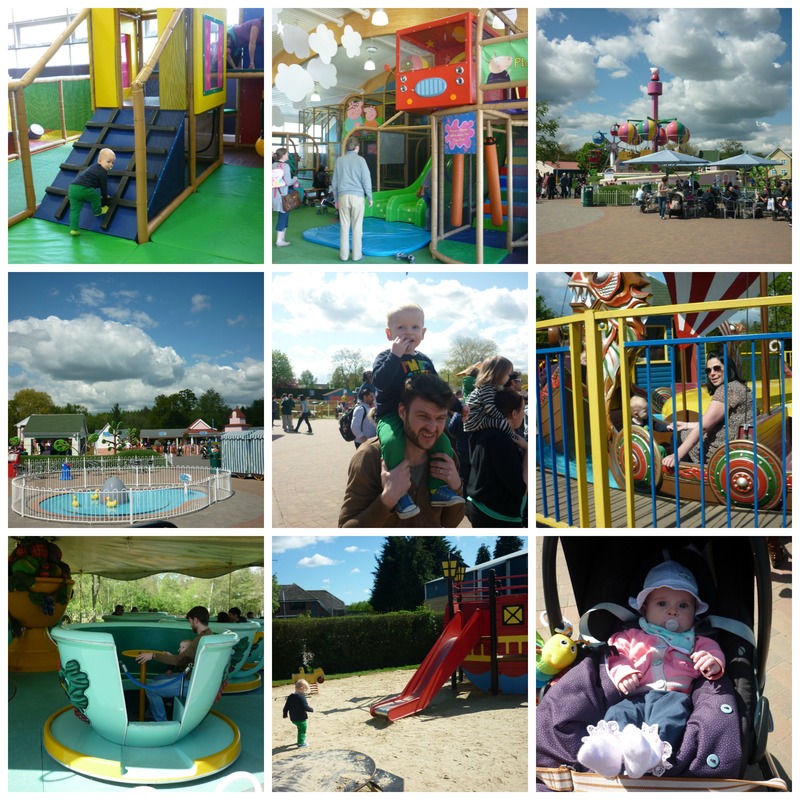 Make sure you pay Paultons a visit soon! 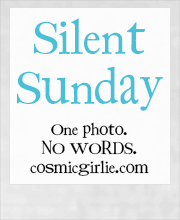 Sorry…. we are planning a visit in August. 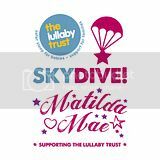 Looking forward to it lots now! !